LMA 19: See You Soon Atlanta! A panel of diverse directors, CMOs and CBDMOs from Am Law 100, 200 and beyond will share their best practices for demonstrating value to the firm’s leadership and the internal client. Gain tips and takeaways through real-life examples and success stories. Plus, hear stories about what not to do when you want to be heard. Your input and participation is encouraged and there will be ample time for your questions and comments. You will leave better equipped to forge a plan of action and timeline for becoming a trusted advisor to the firm while seated at the power table. Did you know that several members of the ContactEase team are former law firm marketers? While we’re no longer working inside law firms five days a week, we use our experience every day when talking to clients. We understand how challenging it can be to show your value and find your voice. We look forward to taking the information we learn in this session and sharing it with our clients. Law firms are continuing to pursue efficiencies — from technological advancements to outsourcing roles. Allowing certain support staff roles — or specific projects — in both the practice and business of law to be outsourced has been beneficial in enabling law firms to focus on the evolution of legal services. Outsourcing is relevant to marketing leadership, whose teams are often stretched thin and yet face expectations to deliver results, which are higher than ever. This panel dives into how to maximize your use of both external and internal resources to achieve strategic objectives. Clients often come to us looking for ways to increase efficiency. Often this is by integration marketing automation tools with CRM (see Yes, You Can Successfully Integrate Your Website with CRM for one example). While some clients seek to optimize efficiency through integration of their technologies, others look to outside consultants. We’re excited to learn how marketing departments are making the case for these additional resources, who they’re hiring and how they keep the momentum going. Research suggests that up to 70% of CRM implementations fail to meet expectations. This not only results in a tremendous loss of money, time and resources, but also stress and anxiety for marketing professionals trying to implement the systems. But CRM systems don’t have to drive you crazy. During this therapy session (aka, presentation), marketing professionals who have implemented a variety of CRM systems will share their biggest headaches and frustrations from a “therapy couch.” And, the CRM “doctor” will offer some of the most successful “treatments/remedies” that include best practices for CRM success. In this engaging and outside-the-box presentation, you will benefit from a “CRM therapy” session covering a variety of topics. ContactEase has one of the highest CRM adoption rates in the industry (over 90%). Clients will often come to us having experienced a failed CRM implementation. Over the years, we’ve developed our own playbook for successful implementations. We’re excited to learn from other firms’ experiences — how to avoid common pitfalls, set and achieve goals and work as a team. What sessions are you most excited about this year? Will you #stayuntiltheend? In the recently released 2019 Legal Marketing Trends from FSquared Marketing, Jennifer Whittier from ContactEase shares why she thinks 2019 is the year of the bridge when it comes to CRM data. Jennifer joins other leading law firm marketing experts to share insight on important trends for 2019. Jennifer Whittier in CRM in 2019: The Year of the Bridge. Click here to read the 2019 Legal Marketing Trends from FSquared Marketing. NEW ORLEANS — The Legal Marketing Association (LMA) has selected Bradley as the First Place winner in the Technology Management: Software and Applications category of the 2018 Your Honor Awards. The award was presented to Bradley and technology partners, ContactEase and CLIENTSFirst Consulting for its CRM implementation, Bradley Connect, at the 2018 LMA Annual Conference in New Orleans. The project was also recognized with an honorable mention in the Technology Management: Applications and Innovative Use of Technology category. The LMA Your Honor Awards program recognizes excellence in legal marketing by promoting projects and programs that showcase innovation and return on marketing dollar investment. A panel of expert judges awarded first-, second-, third-place and/or honorable mention in 16 categories, encompassing work related to business development, business of law, client services, communications, marketing management and leadership, and technology. The implementation was a tremendous effort on behalf of the firm’s teams. Attorneys and staff had little faith in prior systems because contacts could not be globally updated and relationships couldn’t be identified or segmented, resulting in redundant emails asking “who knows whom” and an inability to track open and bounce back rates. Looking past the implementation process, it was important that users understood the firm’s goals for the system. It was also important to staff the firm properly starting with the Marketing Technology team led by Jacqueline Madarang and Bradley partner, Justin McDonald. Users can now see “who knows whom” and other relationships a client may touch. They can now add contacts to mailings and are seeing the results of this relationship intelligence – they now benefit from seeing the relationships within the firm. Attorneys once hesitant to share contacts are now doing so. Of the almost 500 users trained, the few not participating are due only to scheduling and not resistance. For a complete list of the 2018 Your Honor Awards winners, visit www.legalmarketing.org. Learn more about Bradley at bradley.com, ContactEase at contactease.com and CLIENTSFirst at clientsfirstconsulting.com. Founded in 1985, the Legal Marketing Association (LMA) is the universal voice of the legal marketing and business development profession, a community that brings together CMOs to entry-level specialists from firms of all sizes, consultants and vendors, lawyers, marketers from other professions and marketing students to share their collective knowledge. More than 90 percent of the largest 200 U.S. law firms employ an LMA member. Members at every stage in their career development benefit from participating in LMA’s array of programs and services. LMA has eight regions and dozens of local groups across the U.S. and Canada, and its more than 4,200 members hail from 49 U.S. states and 28 countries. For more information, visit www.legalmarketing.org. If you would like to connect with LMA regarding this press release or the Your Honor Awards, please contact Stephanie Kusibab of the Legal Marketing Association at (312) 673-5954 or skusibab@legalmarketing.org. Gambling can be great fun in Las Vegas, but gambling on an investment like CRM? Not so much. If it’s time to invest in CRM (or if your current system isn’t working as well as you’d like), be sure to stop by Booth 315. You’ll have the opportunity to mix and mingle with current ContactEase clients who will share their insight and experiences on everything from making the case for CRM and getting buy-in from management to successfully implementing the system and showing a return on investment. Don’t take a gamble with your marketing dollars or the trust of your attorneys. John Simpson, CEO, and Kalev Peekna, Managing Director of Strategy for One North Interactive lead an engaging session during the LMA Annual Conference entitled: Playing the Relationship Game in Today’s Connected World. The session focused on the effects relationships have and how they can impact a firm’s business and opportunities. From the session, the key lesson that resonated with me was that in the relationship cycle many firms are not participating in the “Active Evaluation” phase. 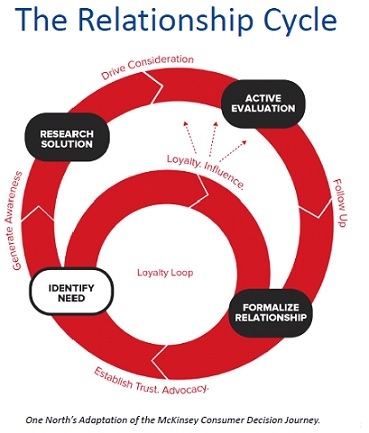 It is in the evaluation phase that you can really learn about your business; then by following-up on the feedback, it formalizes a relationship and creates loyalty. It shocked me to learn from the session that only 1 in 8 (12%) of firms always meet up with their clients to see how satisfied the legal department was with their work and 18% NEVER meet with their clients to discuss satisfaction. By engaging your clients and asking for feedback it opens the dialogue so that in future situations if an issue arises they may feel more comfortable coming forward with issues or input. Client retention should be a key part of the marketing and business development plan. INTERACT: Does your firm actively seek feedback? The LMA Annual Conference kicked off this year with an inspirational keynote speaker, Kat Cole, President, Cinnabon Inc. Kat’s presentation “The Difference – Lessons in Leadership, Change, and Driving Innovation” provided concrete leadership examples while tying them back to practical applications within firms. You should be thinking about what strategic partnerships make sense to expand your business and brand. When being approached for a partnership, you should always ask “will I be a competitor or a collaborator,” make sure it is the right fit. You need to be building relationships or the competition will. Think about how you can partner with the people who can help your business grow. You should be looking for partnerships, not waiting for them to knock on your door or you will miss out. Lastly, no matter what, none of the above matters if you are not making a positive impact on the people around you! You need to know how your brand got started… what got you to where you are today? Cinnabon focused on relevance and differentiation to build their global brand and firms should too! Products have to be differentiated to stand out in the market, services are no different. In order to build your brand you need to deliver value to those you serve. Cinnabon’s goal is to WOW their guests. Kat listens to feedback, reads tweets, and completes searches to see what people are saying about the brand. That’s how you innovate and create new products or offerings. Lastly, don’t be afraid to reach out to your biggest critics and ask them “how can I help you?” They may become your biggest supporters! The Hot Shot Rule: Think what would a hot shot do in this situation? You have to be willing to do things differently! Bring new ideas to the table and don’t be afraid of change. Settling and just being grateful for what you have can also lead to complacence. Make sure you are always evaluating yourself and striving for excellence. Question yourself and listen to others, make the call to make a change. INTERACT: If you attended the session or have seen Kat speak in the past, what were your favorite key takeaways? If you weren’t in attendance of the LMA Annual Conference last week don’t worry! Over the course of the next two weeks we will be recapping the key sessions and takeaways from the conference in our new blog series: Insights from the LMA Annual Conference. Tomorrow’s post will recap the keynote presentation from Kat Cole, President Cinnabon Inc: The Difference – Lessons in Leadership, Change, and Driving Innovation. During the conference we also asked attendees what they would suggest others do to continue to keep their firms moving forward this year. We will be posting a new suggestion each day. Make sure to check out our Twitter feed and follow us www.twitter.com/contactease.